With all his time and energy spent on promoting and touring with Digging Up The Marrow, Adam Green's latest project Scary Sleepovers almost went unnoticed. That is until he did an interview with Broke Horror Fan. On the tour, you showed a preview for your Scary Sleepovers web series, which looks like a lot of fun. Can you tell us a little bit about that? 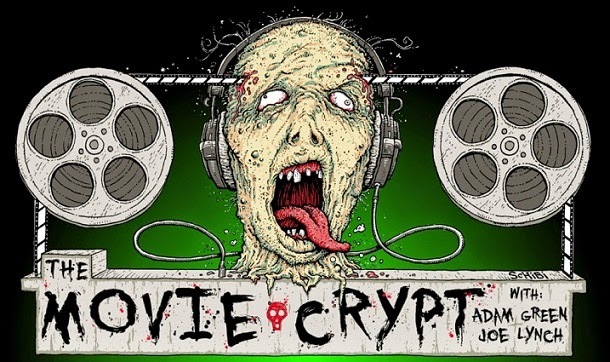 When Joe Lynch and I started doing the Movie Crypt podcast, originally we were just going to do it for the 10 weeks that Season 2 of Holliston was airing. It was just going to be extra promotion for that. We really had no interest in doing a podcast. I feel they’re like Facebook pages now; everybody has one. Then it turned into this huge thing very quickly. Now people call it audio film school. Entertainment Weekly put us on their top 20 podcasts. It was huge. A few weeks ago we trending at #7, I think. We were right behind NPR. I was thinking, “Wow, people listen to 2 or 3 hours of talking. There’s gotta be a way to do something that’s shorter, quicker and more visual-based, but what would be something that’s really fun?” I came up with the idea of having horror celebrities and icons come to the ArieScope studio and have a slumber party, which is so weird. When you watch these people like Sid Haig in their onsies and pajamas and sleeping on the floor in sleeping bags.. We’re just sitting there eating ice cream and candy, and I’m interviewing them about what scary to them. It’s turned into this really cool thing. A lot of it’s funny. They’ll bring props from the movies and show them to me and talk about them, or sometimes we’ll watch one of their movies and talk about it. But when it gets to the part about asking them what actually scares them, nobody has been funny yet. Kane Hodder is the pilot episode, and his was all about dementia and how his father-in-law has Alzheimer’s. It was really touching and really serious. I didn’t expect it to go there, but I was really happy when it did. It set a precedent that it’s not always going to be silly and funny, that it can be serious sometimes. Every single person who has come afterward, as ridiculous as some of it is - somehow I end up naked in the Derek Mears one; I don’t know even know how that happened - then it gets really serious when you ask them what they’re scared of. There’s no answers like, “I’m scared of spiders” or “I’m scared of bees.” It’s all very serious stuff. I love this genre so much. I love the community. I love the culture. I like doing things like this that let fans in a little bit more. Thankfully, because of the friendships that I’ve made with the other people who do what I do for living, they’re always game to do these things with me. I think it’s going to be fun for fans to get that much more up close and personal with everybody and see them for who they really are. Any idea when we’ll be able to see it? The first episode is supposed to come out March 4th, which is a week from today? Wow! I hope that really happens. My friend Sean Becker, who directed a lot of the episodes of Season 2 of Holliston and Felicia Day’s web show, The Guild, he’s the one directing these. I come up with the concept, I host it, I put it together, and then he and [cinematographer] Will Barratt film it. Sean is the one putting it together. I still haven’t seen any of the episodes put together yet. I think tomorrow is the day I start watching them and giving notes. It’s fun for me, because for once I’m not the one doing every single thing. I think it’ll be more objective having someone else cut it together. I believe the plan is to have a 10-minute long version on our YouTube channel and a longer version that you can watch on ArieScope.com that’s uncensored. It’s still premature, but I’m pretty sure the first few episodes are going to be free, and then maybe it’s going to be a subscription rate or something, or they might all be free. I’m really not sure. I just came up with and we shot a ton of them and it’s all being put together now. I wish that we had more time before me we made that promo, because we’d only shot like 4 of them when we edited that promo together, and we’ve since shot a ton more. There’s some really, really funny stuff.